In 2016 Chief Executive Diane Leicester-Hallam decided to throw herself out of a plane…. for the cause of course! Here she tells us why she’s taking to the skies. 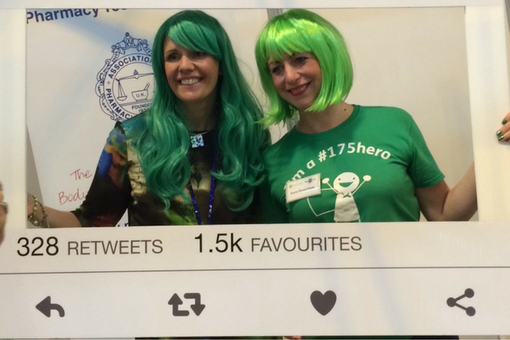 2016 was Pharmacist Support’s 175th anniversary, and everyone at the charity agreed that it was such a remarkable milestone that it really couldn’t go by without recognition. The team got their heads together and came up with the idea of a 175 campaign, which was in itself a pretty ambitious plan of engagement for a relatively small team. We spent all year running around the country meeting the fantastic professionals within the pharmacy world and encouraging and supporting them to sign up to raise £175. We saw some remarkable achievements and it was totally humbling to see so many people get behind us and support PS. During the year Emma (our PS Fundraiser) and I, were discussing what our 175 challenges could be, and as soon as the idea of a sky dive was proposed I was in. The idea of dropping out of a plane struck me as something that I just wouldn’t get the opportunity to do ordinarily. Put in its simplest terms I figured that once you’re up there, standing in that plane, the expectation to complete the deed (and not disappoint myself or the people who sponsor me!) is going to be so great, that I’ll force myself to do it. Thankfully, Emma is game for anything so immediately said she would join me (the additional pressure of having one of the team there too, was even better!). We had a date booked, but then sadly I developed a back problem and was in a lot of pain for several months, so we put it off with the intention of waiting to see how readily it improved. I’m delighted to say, that the pain went away, I feel a lot better and as I haven’t had any pain at all for a couple of months now, we decided to go for it and get a date booked in. Happily this date coincides with the charity 176th birthday on the 15th April, so clearly it was meant to be! In all honesty I’m not that worried about the jump, as let’s be honest it’s essentially a fall and so gravity is going to do all of the work. I think that’s my own personal way of managing the anxiety that comes alongside this type of challenge. I’ve heard just about every statistic (and thanks people, you know who you are!) regarding the chances of injury etc, but I figure – hey, I’m signed up so let’s just get on with it. I would be really, really, really grateful if people can spare just a little of their hard earned cash to sponsor me. I was recently asked why I am doing it and the answer is very simple. I know the fantastic work that the team at Pharmacist Support do, and how much they help the people that approach us. I’m fully committed to supporting the continuation of that support in any way that I can (except a marathon, sorry Aamer but you are on your own with that one). Over the course of the year I’ve been inspired by the amazing things people have done to raise cash for PS, from running 5k to 155k, cycling, baking and making things. Its great to be part of the hero community and I’m looking forward to literally earning my wings! To support Diane and Emma, visit their justgiving pages here & here.